In what may be a wee bit of overkill, Russia may supply Syria with up to 8 x S-300 systems. 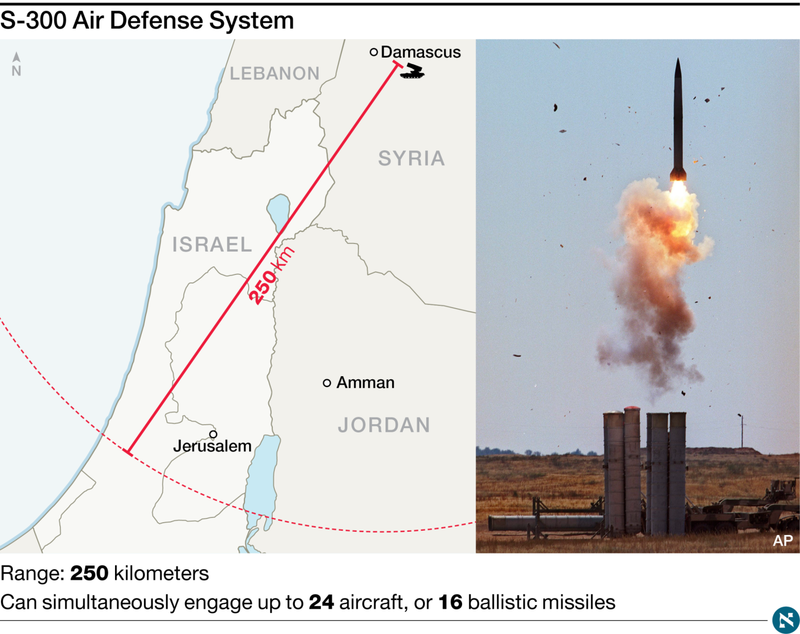 An S-300 can cover almost all of Israel from Damascus, with only one system. Initially, Russia would probably supply two and have four on the ground shortly thereafter. I keep contemplating how Israel is going to take out the S-300 systems on the ground. I don’t know Israel’s cyber or EW capabilities, so I can’t make an educated guess. For Israel it’s not a game, it’s not theoretical. A threat is staring them in the face. This is “Raid at Entebbe” time, Six Day War, the Yom Kippur War and Operation Mole Cricket 19, all rolled into one. I expect something spectacular and absolutely humiliating to Russia and Syria. The consequences? First, “the juice is worth the squeeze”. Russia is already incensed with Israel but I do not believe they would mount an all-out offensive against Israel. Israel can justify its action, the S-300s pose a direct threat to almost all of Israel, especially any and all air operations, commercial and otherwise. Syria is considered unstable by Israel. Throw Iran, already operating within Syria, into the mix, and randomly sniping at Ben Gurion Airport becomes more of a probability than a possibility. I actually had a funny thought while contemplating this. What if, somehow, Israel could insert a false icon of an attacking Israeli plane on the Russian cargo aircraft bringing in the first one or two S-300 systems? Israel’s security cabinet convened Tuesday morning to discuss the diplomatic crisis with Russia ahead of Prime Minister Benjamin Netanyahu’s departure to attend the UN General Assembly session in New York, where he is expected to bring up the row with Russia with U.S. President Donald Trump.